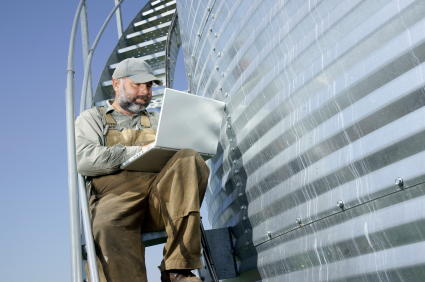 A few years ago, we identified a real need in the agricultural market for more robust, internet-connected farm networks. This was driven by our work in precision agriculture; what we saw was that there was a glut of usable data that could be helping growers make better (and more profitable) decisions, but that data was mostly trapped on personal computers and in-cab monitors. As we looked at this situation, we realized there were two equally important needs which were interrelated: the first is a comprehensive platform for turning all this raw data into actionable information, and the second was a facility for collecting the data and putting it to use. But there’s a “chicken and egg” problem here: if you don’t have the data, you can’t turn it into information, but there’s no good way to collect and use the data currently. So we decided to tackle the second problem: create an “Enterprise Network” for farmers and ranchers, so they could collect data from their farm operations effortlessly and use that data to make more informed decisions. We realized, of course, that a typical network was not going to work for the farm: everything is very far apart, so laying cable (or even fiber) is generally not a workable solution. Besides, the network should ideally encompass the tractors, sprayers, and harvesters out working in the fields, so wireless is the only option. This was the impetus that gave birth to the original AyrMesh Hub. Design the system for a farm – provide good bandwidth to relatively few “clients” spread over a very wide area. Most WiFi devices in the market today are designed for exactly the opposite: a metropolitan mesh network, where you have many people in a very small area and high bandwidth demands. What we have seen is that, like all technologies, there is an adoption curve. The first step is the desire to use one’s Internet connection beyond the confines of the house. Especially with the advent of smartphones and tablet computers like the iPad, the ability to have instant information and communications everywhere you go on the farm can be a reality, even if cellular data is not available everywhere on your farm. ductivity gains. Knowing the temperature and humidity in your livestock barns can help optimize your HVAC usage, while knowing the wind and rainfall in a distant field can save a trip if it’s too windy or too wet to work. In addition, some of the precision agriculture vendors are starting to put WiFi into their in-cab monitors, so you can access the data on those monitors over the network instead of having to move cards or USB sticks around. Being able to access your “as applied” and harvest data allows you (or your agronomist) to much more easily determine your variable rate applications as you go through the season, potentially cutting your costs and maximizing your yield. The third step is farm control: being able to actually get things done on the farm over the network. Grain dryers, pumps, irrigation systems, HVAC systems, and other equipment could be controlled over the network. This means that you can potentially control your grain dryer from the bedroom, or even while you’re running errands in town, since your network is connected to the Internet. What we learned in the 1990s and 2000s when networks were becoming ubiquitous in the corporate world is that the presence of the network creates opportunities to improve the business in unexpected ways. We don’t pretend to know what all the uses are for a wireless farm network, but we’re very excited to see what they are. We’re here at the very beginning of farm networking, and the future is limitless. This entry was posted in Ayrstone Products, Farm Networking and tagged data, farm network, farm wifi, precision ag, wireless farm network on July 3, 2013 by billmoffitt.